Last year on Mother’s Day, my mom and I spent the day visiting Henry, Jack, and Sophie in the NICU. 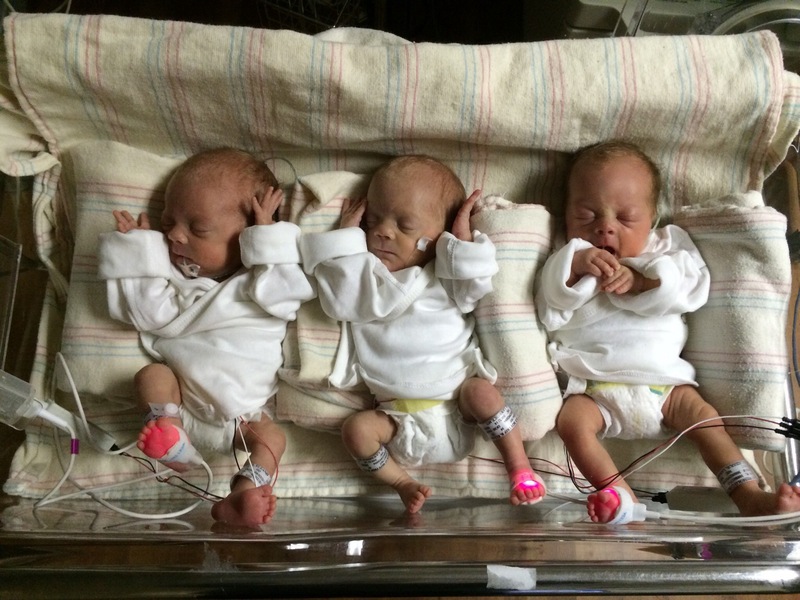 They were about four and a half weeks old, and still nearly eight weeks shy of their actual due date. It was wonderful to be a mom but tough to come home that night without my babies. Will and one of our nurses, Tita, had arranged for this photo. During the photo “shoot” they had to supply Henry with oxygen in between takes. The first time the trio had been together in one space since before they were born. It now hangs on our wall in the apartment. A couple weeks later, we took the first photo with all three babies in my arms. It took an awful lot of maneuvering, rearranging the wires–not to mention the babies!–until everyone was comfortable. Yesterday, we went to the park. Getting Henry, Jack, and Sophie all in one photograph still proves to be a difficult task. But not because they need oxygen or share nine monitors (and corresponding wires) between the three of them. And not because they can’t hold their heads up. But because these silly toddlers (can I really call them toddlers?!) won’t sit still. 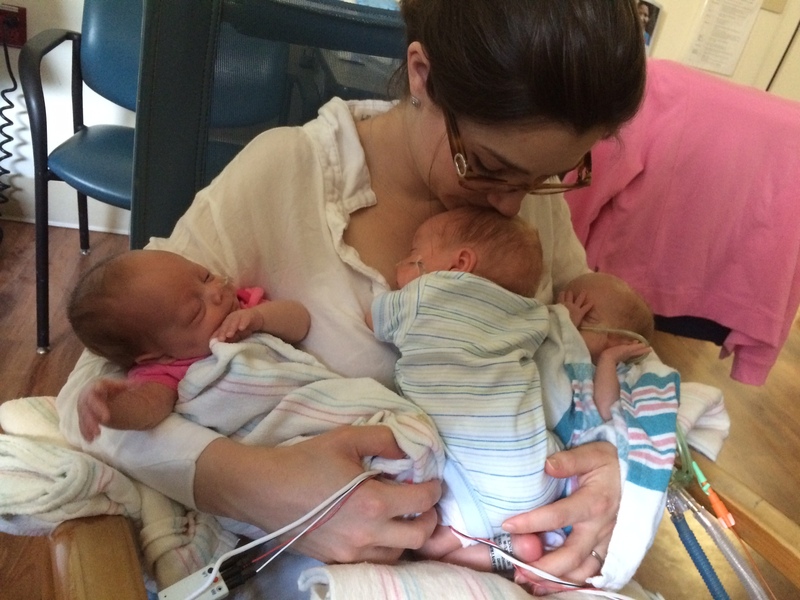 This Mother’s Day, I was struck by how lucky I am that my arms are just as full as my heart. It is pretty amazing to me that these little people are here today, doing what they do (crawling, rolling, dancing, singing, clapping, chatting, high-fiving, standing, smiling, laughing, hugging, and kissing). I really don’t need a special day to feel loved. Every smile when I walk into their nursery each morning reminds me that I am. They say the unconditional love of a parent is like nothing else. And, speaking as a parent, I think that’s probably true. I cannot imagine loving anybody or anything as much as I love Henry, Jack, and Sophie (sorry, Will). But the unconditional love of a child? That’s pretty incredible too. Most times, all I have to do is show up, and they are grinning from ear to ear. 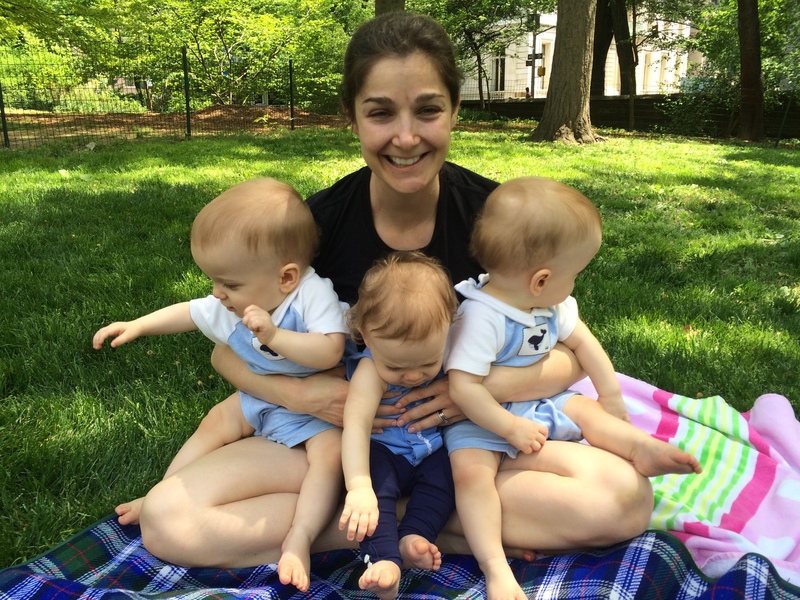 Some days, it’s hard to be a working mom of triplets. But most days? They make it pretty easy. Three babies in a box. My Mother’s Day gift!